Chicago, IL. This is the epitome of international office-tower architecture: a uniform curtain wall “draped” over a steel frame. 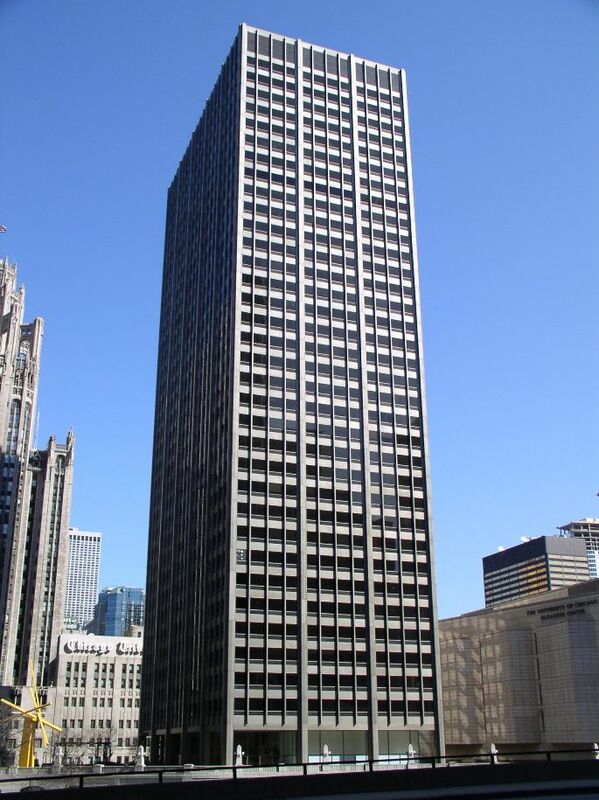 PERIOD OF POPULARITY: 1940s – 1970s (mostly 1950s – 1970s for office towers and other high rises). IDENTIFYING FEATURES: Modern structural principles and materials: concrete, glass, and steel are the most common; occasionally reveals skeleton-frame construction, exposing its structure; rejected non-essential decoration; ribbon windows and corner windows are a hallmark of the style; bands of glass are as important as bands of “curtain wall”; balance and regularity admired and fostered; flat roof, without ledge. Often with thin, metal mullions and smooth spandrel panels separating large, single-pane windows between floors. High-rise buildings are boxy and completely devoid of ornamentation or other stylistic features other than the sleek appearance of steel, glass, and plastic. Hence the term, “anonymous glass box”. BACKGROUND AND INSPIRATION: Even more radical than art deco or art moderne, the international “style” was promoted as a solution for those who scorned art deco. Typical applications were the same, however. It was rarely used for houses and was more common for commercial and institutional buildings through the 1970s. Except for houses, international-style forms completely dominated American architecture from the 1950s through the late 1970s. This (anti-) style epitomized the height of the modern movement in the United States and Europe. By the late 1920s, American architects and clients were increasingly persuaded that European modernism was both visually progressive and structurally sound. After WWII, American interests were characterized by a confident, enthusiastic desire to “get on with the business of progress”. The ideas of the earlier International style that emerged in the 1920s and 30s were still potent, and thus the style flourished during the first major building boom, 1948-49. The leading architect and proponent of the style after the War was Ludwig Mies van der Rohe, who believed in structural honesty and designed some of the earliest glass and curtain-wall office towers of the 1950s. Pragmatic utilitarianism became the driving force throughout America, and even more so in Europe. 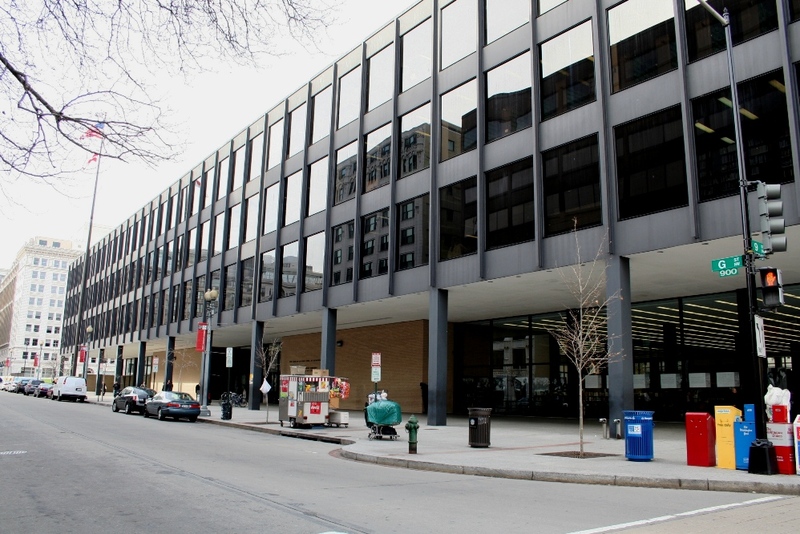 Commercial architecture became an increasingly important form of public relations: the building provided an image for a corporation desiring to promote itself. The “Miesian glass box,” also referred to critically as the “anonymous glass box” due to its lack of distinctive styling, appeared throughout small and large cities throughout America and Europe between the late 1950s and 1970s. The World Trade Center towers (c.1974) in New York City represented the height of the International-style office tower of the 1970s, literally, as still does the (former) Sears Tower in Chicago. For More Photos of International Style on Flickr, Click Here. Cleveland, OH. 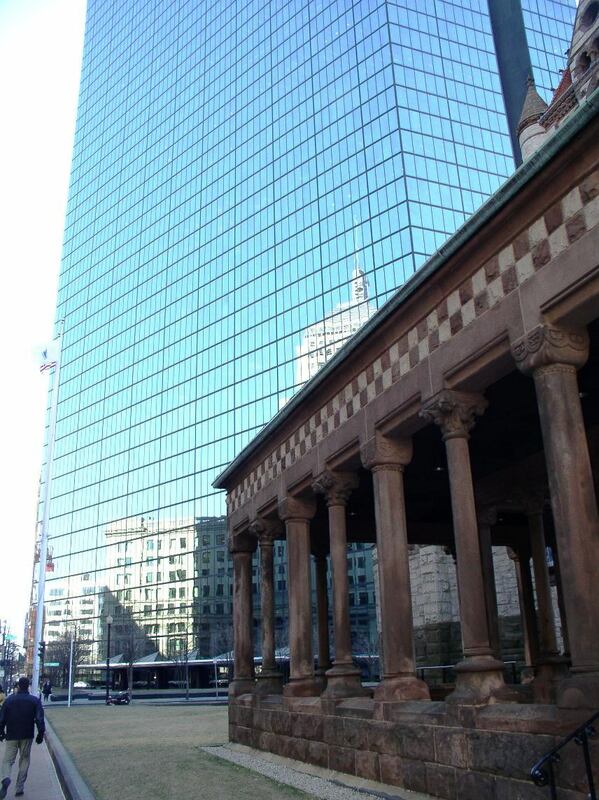 A uniformly designed international high-rise tower looks down over a much earlier neoclassical structure. New York, NY. 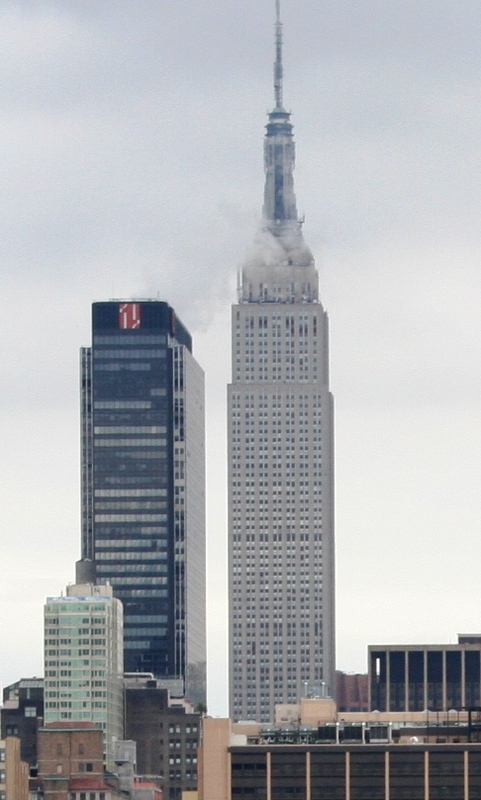 The Empire State Building (right), built 1929-31, representing a transition between the Art Deco and International styles. Though considered art deco in popular accounts due to its distinctly Art Deco upper floors, tapered cap, and interior design elements, the main tower shaft represents the minimalist International style. The shorter tower pictured to its left represents a later, postwar version of International Style. Washington, D.C. The Martin Luther King Jr. Memorial Library. c.1972. Architect Ludwig Mies van der Rohe, the only public library of his career. Venice Beach, CA. 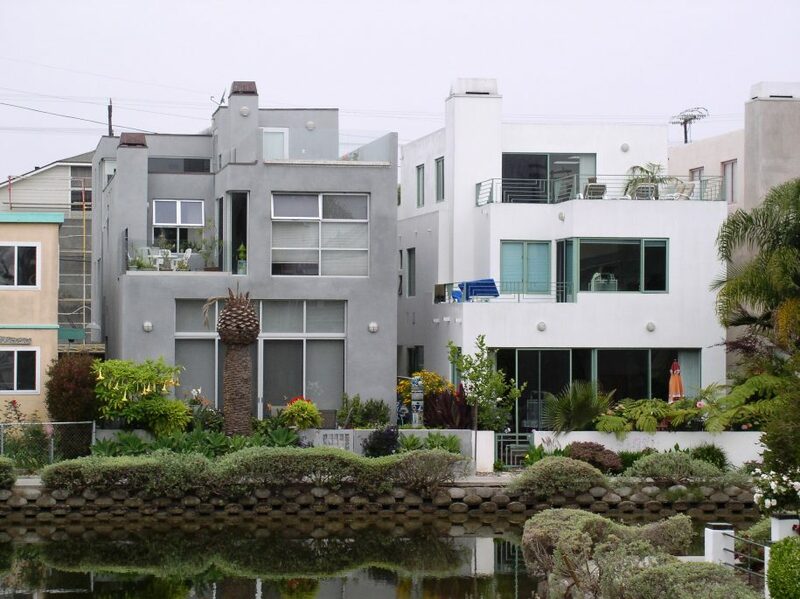 Early international-style houses, likely transitioning from the art moderne period around World War II. Boston, MA. The John Hancock Tower, c.1968-76. A “glass monolith” skyscraper that does not use spandrel panels or thick mullions between the windows. Considered an achievement in modernist minimalism, designed by the firm, I.M. Pei & Partners. In front is Richardson’s Trinity Church in stark contrast. Flagstaff, AZ. The Bank of America Building, c.1961. 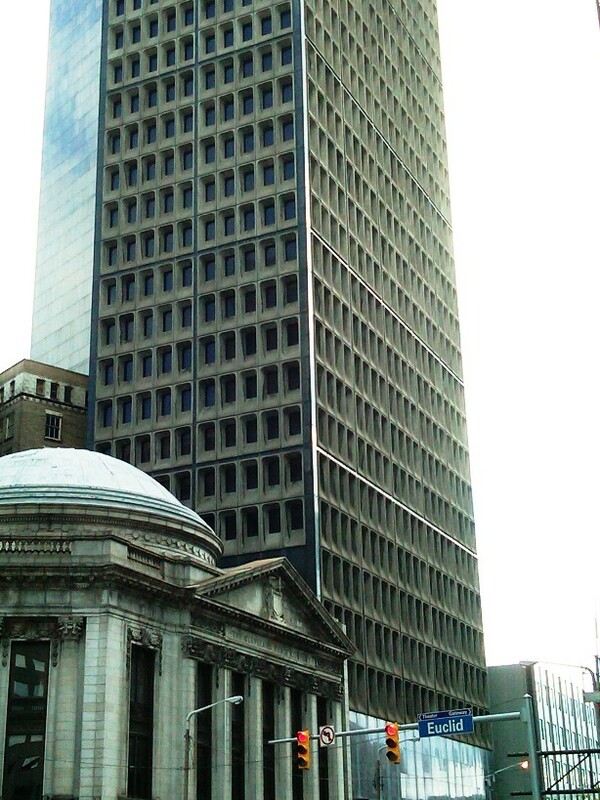 This is a typical appearance and design for international-style office towers of the 1960s, small and large. 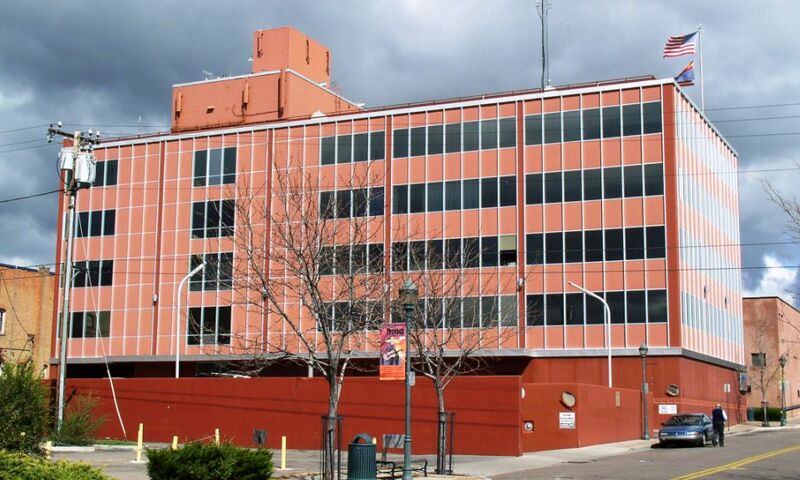 Includes plate glass windows separated between the floors by spandrel panels (red). Chicago, IL. 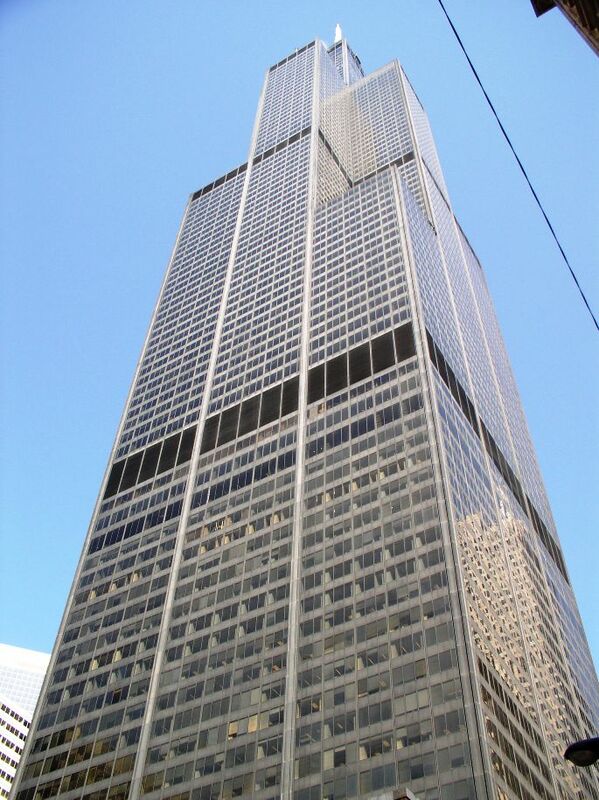 The Willis Tower (formerly the Sears Tower), c.1970-73. Designed by Skidmore, Owings & Merrill as a “tube building,” with nine individual tubes in a 3×3 matrix, each lower tube providing structural support for the upper ones. America’s tallest building, with 108 stories.